PT Indofarma (Persero) Tbk - Indofarma is a reputable state-owned integrated pharmaceutical and healthcare company in Indonesia, based in Bekasi West Java. Indofarma running business in the field of production and distribution or pharmaceutical and healthcare products. Indofarma is a public-listed company and is listed on the Indonesia Stock Exchange (IDX) since 2001. The Company's shares are traded under stock code of INAF. As today, the majority of Indofarma’s shares are owned by the Government of Indonesia (80.66%) which represented by the Minister of State-Owned Enterprises (SOE). Other 19.34% remaining shares in Indofarma is held by the investor and general public. Indofarma now supported 2 subsidiary/affiliated companies, namely PT Indofarma Global Medika and PT Farmalab Indoutama. Indofarma's head office is registered at Jl Indofarma No 1, Cikarang Barat Bekasi West Java 17530. In term of financial performance, Indofarma closed the business year of 2017 with a negative result. According to information found in PT Indofarma (Persero) Tbk Annual Report 2017 as cited by JobsCDC.com, Indofarma booked total net sales of Rp1.63 trillion in 2017. This number is down 2.59% Year on Year (YOY) from net sales in 2016 of Rp1.67 trillion. Total gross profit in 2017 decreased by 16.06% YOY from Rp336.9 billion in 2016 to Rp282.8 billion. Indofarma registered total loss of Rp 46.3 billion in 2017 as compared with total loss in 2016 amounted to Rp17.4 billion. Minimum S1 degree in Accounting, Economics. Minimum 2 years of experience as Senior Auditor or 3 years as Accounting Assistant Manager. Minimum 5 years of experience as Manager (Audit Manager or Accounting Manager). JobsCDC.com now available on android device. Download now on Google Play here. Please be aware of recruitment fraud. The entire stage of this selection process is free of charge. 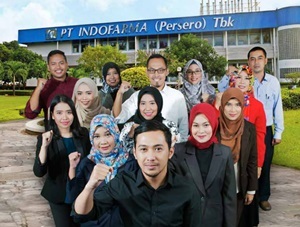 PT Indofarma (Persero) Tbk - Assistant Manager, Manager Indofarma December 2018 will never ask for fees or upfront payments for any purposes during the recruitment process such as transportation and accommodation.